NFL Week 13 ...Will the 3 teams that have over 80% of the wagering on them cover today??? NFL Week 13 …Will the 3 teams that have over 80% of the wagering on them cover today??? Saturday things slowed down as we went from 11 plays on Friday to 4 on Saturday. But no worries as we went 3-0-1 on our 1 unit plays. In College Football we won with Michigan +5 and Boston College +3. We won another college hoop total with Iona under 153 bringing our record to 23-12. And we tied in the NBA with Minn +13. Today again rates to be a very busy day with the NFL College Hoops , NBA, and NHL in full swing. So far today there is 1 one unit play carried over from Friday. I know a sane person would get off Cleveland. But not only do I border on the fringes of sanity but I see no reason to get off Cleveland, yet! When I jumped off San Fran a few weeks ago it was for what I thought was a very logical reason. I see none as to Cleveland. The only solace I can give to that pick is usually in the NFL the worse the side looks the better bet it is. Cleveland is the type of pick that you get silence when you suggest it is the right side. And from the people that are disrespectful, you get laughter and ridicule. That’s how bad that pick looks. Let’s see how that theory holds today. 5 years ago Cleveland would have won the game by 20! Today these plays have given up a bit of the juice they had. To put that more in perspective if you faded the top 5 for your picks in the Hilton Contest you would be in 6th place and only 1 point our of first for the 1,000,000 first place prize! Not bad for a system that requires no thought. However, since you cannot find the top 5 until after the windows are closed that approached is not possible. But you can use the top 5 as a filter for your bets on Sunday. If it were me, it would be an absolute filter that would preclude you from wagering on any of the top 5 teams. 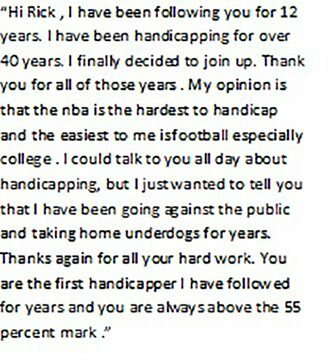 In addition, I would give extra weight to the other side in my handicapping. I know ifs fun to study interceptions, passing completions, fumble recoveries, quarterback matchups but fun is all it is. Most of that just leads you in the wrong direction. I do not know of 1 handicapper that is successful using these stats in their handicapping. I will go as far to say its a complete waste of time going that route. Aside from the enormous amount of time you will spend it will lead you to the wrong conclusion more often than not. Animal spirits are very high today with 3 games in the 80s with Seattle close at 79.
in any of these 4 teams. One other tip: When you are considering making a wager you need to know where your edge is. You should be able to define it, understand why it’s an edge, and also have an idea the degree of the edge. I bring this up to not only try to make people aware of the behavioral loop sports bettors get in but also there is a way to get out of this loop. But it requires a complete change in the way you think and analyse sports betting. I have made the transition from punter to a winning sports bettor. It took a lot of time and thought to do that. In addition, it took many a beating week after week and month after month for me to figure out the complexities of betting sports. You can follow along and learn from this site as many have done over the last 13 years. You do not have to subscribe to learn here. Go back and read from day 1 and watch the evolution my techniques have taken throughout the years. I assure you when you are finished you will have learned more than you would think possible. 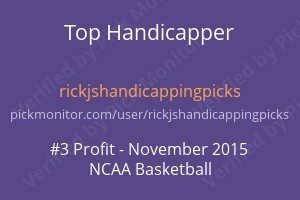 And if you are open to changing your thinking you will have the chance to become a positive EV sports bettor. Now, when you subscribe to this site not only do you get the games I wager on myself, but you also get email contact with me for any questions you might have on any game or anything for that matter. There is no other service out there that #1 is so reasonably priced but more importantly #2 produces positive EV plays consistently year after year. I will match my plays with any service, even the ones that charge 4 figures for each sport each season! The Paypal drop down menu has the subscription options and all have a 3-day free trial!!! Enough self-serving comments this morning!